What would your CBA include? With a new CBA looking like a pipe dream this side of Christmas NHL fans have grown tired of debating the merits of the NHLPA and NHL’s recent proposals. 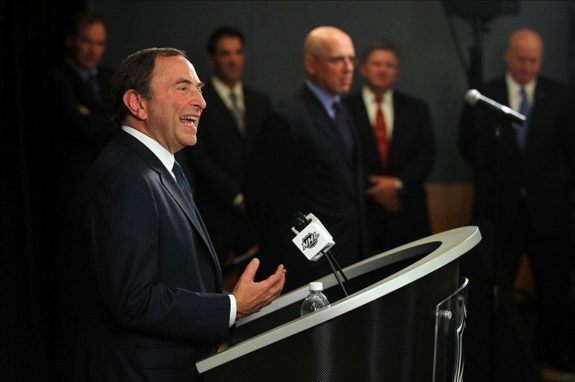 While both sides of the argument have merit, the two sides remain at odds on numerous issues, including how to determine hockey related revenue and whether or not the owners should “make whole” on the players current contracts. Whenever two entities as powerful as the NHL and NHLPA are negotiating a deal where hundreds of millions of dollars are at stake there are bound to be disagreements, but I think I have found ten things that should be included in any new CBA. Here is my top ten. 1. A five year limit on player contracts. Owners have killed themselves with long-term deals that vary between eight and 14- years in length. A move towards a more reasonable five-year term would protect the owners from making huge errors in judgement and take away the concern of front-loading contracts in order to make them fit into the cap. 2. Ability to trade a portion of player salary. Since the last CBA was approved there has been a steady decline of “big deals” made at the deadline. At the heart of the issue is the inability for teams to absorb player contracts, making it all but impossible to make significant change. Allowing NHL teams to trade a portion of a players salary in order to consummate a deal makes sense on so many levels, so why not allow it? 3. No more guaranteed contracts. The NHLPA would fight hard against this, but guaranteed contracts are killing a number of teams that are saddled with enormous contracts that they cannot get out from. The NFL allows for heavy signing bonuses in return for not having guaranteed contracts, the NHL should look at this concept. The NHL’s latest proposal includes a rule that would see all contracts over $105,000 count against the cap. Essentially this would take away the advantage that some NHL clubs have where they can bury a players contract in the minors in order to clear cap space for their NHL roster. This is an unfair advantage for the “haves” and should be abolished. 5. A 50-50 split of all hockey related revenue. Both sides seem agreeable to a 50-50 split of HRR, and while it will take some trust on both sides to determine what that number (pie from which HRR will be drawn) is, the percentages look fair for both sides. The no-trade clause is completely in the players favor. If a team wants to trade a player that has a no-trade clause the player has the option of digging his heels in and saying “no”. On the flip-side, if a player with a NTC wants to be traded he can demand one from his team AND insist on being moved to a team of his choice, or a diluted list of teams that he is willing to be moved to. Essentially the owners are in a no-win battle here, so the best thing to do is to do away with no-trade clauses all together. 7. A one-time amnesty clause for all teams. With the salary cap expected to be lowered over the term of the next CBA several teams may find themselves in big trouble trying to stay under the cap. The NHL should allow every team a one-time amnesty on one contract, allowing them to buy a player out at full value of his contract with no consequence. The player would then become a unrestricted free agent, allowing them to sign on with the highest bidder for his services or retire. 8. Increased fines for players. While increased suspensions looks to be slimming down dangerous infractions the fines levied upon the players are still a joke. Fines should be based on a percentage of a players earnings so they hurt each player equally. The percentage a player can be fined should be linked to the severity of the infraction to a maximum of say 5 percent. Under the current CBA the maximum fine a player can incur is $2500.00. 9. There should be a deadline for a new CBA. Enough with the last second negotiations when the CBA is about to expire. Any future CBA’s should be negotiated and signed six months in advance of the CBA expiring. This would force the NHL and NHLPA to sit down and hammer out a deal much quicker and avoid any future lockouts and strikes. If the two sides do not have one in place both the NHLPA and NHL should be fined heavily! 10. No more salary floor. The current CBA has a “ salary floor” of $54.2 million. While an argument can be made that every team has a duty to spend at a reasonable level I feel each team should be able to spend as they please, and if that means they want to cut costs by employing players on the cheap, so be it. Disagree with my list? Got an idea of your own? Feel free to use the comment box and let your opinions be known!